Borealys Games is an independent studio out of Montreal, Canada. Their team has worked hard since 2014 to bring Mages of Mystralia to Steam, Xbox and PS4 (as well as a few other platforms) in 2017. Announced, what seems like forever ago, Mages of Mystralia is finally arriving on Nintendo Switch on January 29, 2019. As a reviewer, I often stumbleupon games that upon early gameplay footage or walkthroughs peak my interests. Mages of Mystralia has been on the forefront of my mind for months and I found myself giddy with delight when the code arrived and their Coming Soon page was unveiled in the Switch eShop. Without further ado, let’s jump into the review (sorry for the rhyme). Mages of Mystralia is an isometric (most of the time) top-down action, adventure game. The game has you in charge of Zia, a young mage learning spells and wizardry, solving puzzles, and ultimately trying to make the world safe again for mages like herself. 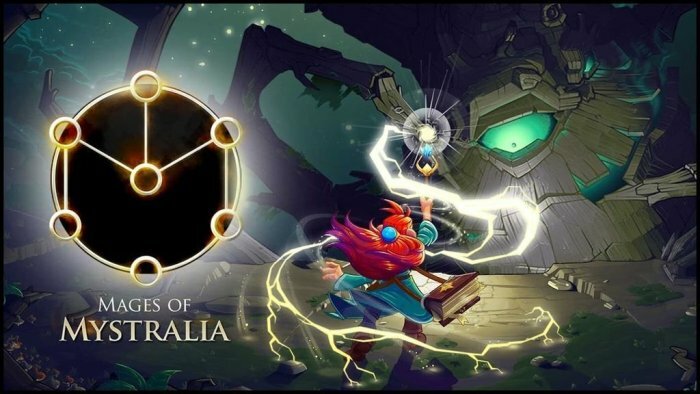 You begin your journey learning that Zia has been chosen to be a mage, her world comes crashing down as the outlawing of Mages is underway and a powerful force seems to be at the heart of the destruction of Mages in the world of Mystralia. Early in the game you will meet a mentor that tasks Zia with learning some spells along with a spellbook that will talk to Zia and teach her the ropes. In some ways, the spellbook is Mages of Mystralia’s “Navi” interjecting ever so often to share wisdom, sarcastic quips, and further the story along. Mages of Mystralia at its core is a love letter to Zelda fans along with other games in the genre, hitting most of the story tropes while introducing a complex and fun magic spell crafting element to the mix. I often found myself smiling as I entered a new biome, and the camera shifted to show me the landscape and feeling as if this game could reside within Hyrule as a Nintendo spin-off series for the Zelda franchise. That is saying a lot and is a compliment to the love and care the group at Borealys Games poured into Mages of Mystralia. The main gameplay of Mages of Mystralia has you navigating the world through towns and villages, a castle, caves, forests, snowy mountains, lava underground and more and if you read that sentence, thinking, yep…Mages of Mystralia checks off most of the standard biome boxes in an adventure game. Along with navigating the world, you will run into beasts of varying sizes and shapes. There’s the dim-witted goblin minions which you will encounter in small and medium-sized packs; some of which will throw spears at you or chase you around the screen. There are larger enemies as well like the goblin that rides a boar and throws dynamite at you and larger mini-bosses with hammers and axe-like weapons that are slow but very strong. Your main quest in Mages of Mystralia is to find out who is causing the destruction of the Mages and saving the people of Mystralia from the incoming doom. Your journey, as I stated before will take you through multiple biomes which act as the game’;s temples (if we are comparing Mages to Zelda). These temples are strewn with spell based puzzles, keys to find, hidden treasure and more. And to top it all off there are your typical mini and large boss battles within the biomes as well. Mages of Mystralia did a great job at creating a world threatened by beast which have been awoken by the evil magic that has flooded Mystralia and the bosses you will fight showcase this really well in their unique designs. My favorite boss battles were within Mystralia Forest and Mage Tomb area. While Zelda games focus mostly on various weapons that you use to traverse the world, solve puzzles, and defeat enemies, Mages of Mystralia focuses on magic spells. Early in the game, Zia will have the ability to create small melee attacks, distance-based projectile attacks, shields and more. The magic abilities you have at your disposal really open up new possibilities about a third of the way into the game. Within the world, you will often find torches that have a puzzle element to them that you need to solve within a set time. Sometimes this requires careful planning and stacking of ability runes to your magic to allow for longer duration of a spell or speed added to your movement to allow you to open up passageways and gain access to ability modifiers. There are also portals throughout the world that transport you to rooms with a chest and a puzzle that once unlocked usually give you access to new runs, soul beads, or a new wand. Mages of Mystralia also has a very simple fetch quest side game that while you aren’t required to do to beat the game, in doing so allows you access to new runes and areas which you may not ever see if you don’t complete the side quest. I found myself completing most of the side quest right alongside the normal story progression since Mages has you traversing the world and areas at least a few times. The side quest characters and random townspeople or soldiers often don’t have much to say, but interacting with them can sometimes lead to details you may otherwise not know. There are also certain story beats in the side quest that are only activated once you talk to certain people. So just like in a Zelda game, you will want to talk to everyone you meet. Mages of Mystralia also has a hint of Metroidvania style gameplay in it, whereas certain pathways or hidden rooms are blocked only opening up when a certain spell is learned, or an aforementioned NPC is engaged in conversation. Revisiting some areas can take a bit of planning since the world map is only an illustration with dots marking the main areas. The way in which you get to certain areas isn’t as straightforward as a top-down map, like in the Zelda series, would have been. There are teleportation points available, only once you discover them, and late in the game, there is a secret area that is accessible only once you commit to a certain character side quest. These little additions of a fast travel system are nice, though it’s limited to three teleportation points. The map does clue you in though on if you have found all of the hidden treasures within the twelve areas of Mystralia. If you have 100% an area you will be greeted with a green checkbox. One thing I do like about the map is that the areas each come with their own bit of description, helping you discern a bit more about where you are headed or need to go by showing a giant exclamation point on your next story quest location. I haven’t talked much about the spell casting in Mages of Mystralia. The game’s hook of creating and making your own spells is very unique. You have four basic slots to fill custom created spells. You can name them using the Switch’s keyboard and make and delete them if you’re no longer using them or if you find a better spell to use. About midway through the game, you will meet some characters that provide you something to augment your abilities. These changes allow you to create stronger spells for both offensive and defensive maneuvers. Spells can also have three basic variations added to them such as behaviors (move, duplicate, bounce), augments (right, left, inverse) and triggers (impact, proximity, periodic). Stringing along runes allow you to create puzzle solving spells, as well and create moves to defeat enemies. Some enemies are immune to certain abilities, which they will show you above their heads with an icon and color. It’s important that you switch up your spells if you find yourself unable to defeat an enemy quickly. Mages of Mystralia also has that exploration aspect of it which I mentioned earlier regarding the inclusion of Metroidvania-like gameplay and learning spells in the late game which opens up new areas of the map. For instance, there are rocks and electric triggers that block your path from time to time. Without the proper impact or move ability attached to a spell you won’t be able to reach certain points. This gating off of areas is not unique to the genre and I really like how it opens up the otherwise seemingly small map areas as the game progresses. If you have gotten this far, it’s not hard to see that I am gushing over Mages of Mystralia. The game is filled with unique gameplay, puzzles, action, adventure, side quest and more. The game is really packed full of content and you’re sure to spend at least 10-12 hours just on the main story. Mages of Mystralia has a great soundtrack as well with audio and music that complements their various biomes. From the lonely isolated feeling of the ice-capped mountain region to the hustle and bustle of the marketplace and castle, the music really fits well with the overall aesthetic of the game. The threats looming over Mystralia are real and the games audio of various magic spells, enemy collision and grunts from bosses are all heard and felt throughout your time in Mystralia. There is a lot that I liked about Mages of Mystralia, from its unique take on the action, adventure genre using spells that I created to its cast of major and minor characters. The story fit well and made me want to pursue finishing my task as Zia became the mage she is destined to be. My only real qualms with the game come down to some various load times that seem to last well into a minute as some areas seem to load slowly to a few frame rate drops when the number of enemies and spells flying around increase. These dips and drops in framerate don’t happen that often but it’s enough to mention here in my review. There are also some odd lighting and shadow issues with some of the cutscenes but those are minor visual annoyances and hopefully can be cleaned up in the future. If you are looking for a competent Zelda-like game and need more indie excitement, similar to Blossom Tales or World to the West, Mages of Mystralia is a great compliment to the action, adventure genre. Some puzzles may require a bit of out of the box spell casting but all in all the game is great and it’s a must-have on Switch if you’re into these types of games. Should you require more convincing however, be sure to click here to check out our in-depth interview regarding Mages of Mystralia.